This is where I share recipes of my own or favorites I’ve discovered along the way. There are also food posts throughout my blog entries. If you have any Louisiana/Cajun cooking questions, I’ll do my best to answer them. Enjoy! Don’t separate when removing them from can. Form a ring from the dough. Bake as directed and ice cake immediately. Sprinkle sugars on before icing cools so it will stick! Okay folks, how easy is that? Say thank you to my friend, Stacie! in our household that would be unkind not to share. I had never heard of “Goldenrod Eggs” before I married twenty-three years ago. Truth be told, the idea of it sounded bizarre when my new mother-in-law shared the beloved family recipe. My own dear family, in my esteemed opinion, was the highest authority on creating all things delicious. I was skeptical, to say the least. And she was my mother-in-law, after all. But Goldenrod Eggs have become our traditional Christmas breakfast–and the occasional weekend treat. Gravy: Pour cold milk into pan and whisk in flour before turning on heat. Add butter. Turn heat on to medium, whisking every couple minutes until mixture begins to thicken and comes to a boil. Turn heat to lowest setting. Add salt and pepper to taste. I often sprinkle in a dash of Tony Chachere’s Creole Seasoning. Slice eggs in half and remove yolks. Set yolks aside for garnish. Use a normal sized cheese grater to grate boiled egg whites into gravy. Toast three slices of bread per plate to golden brown. Use a sharp, serrated knife to cut toast into 3/4 in. squares. Spread toast squares evenly on plate and ladle gravy until almost covering toast. Using a fine grater, grate the yolks over the plates. Note: This is an egg-y dish. Make certain the eggs are completely hard-boiled. It doesn’t work well if the yolks are sticky. Use more salt or Tony’s seasoning over the top if needed. Serve with fresh berries and orange juice. With all my recipes, use your food sense. Taste is subjective. Make changes based on what you like. Flexibility is key. I wish everyone the occasional opportunity for a special Saturday morning breakfast!! I do love a chocolate pudding pie. It’s always more tasty when done with cooked pudding versus instant if you have the time. 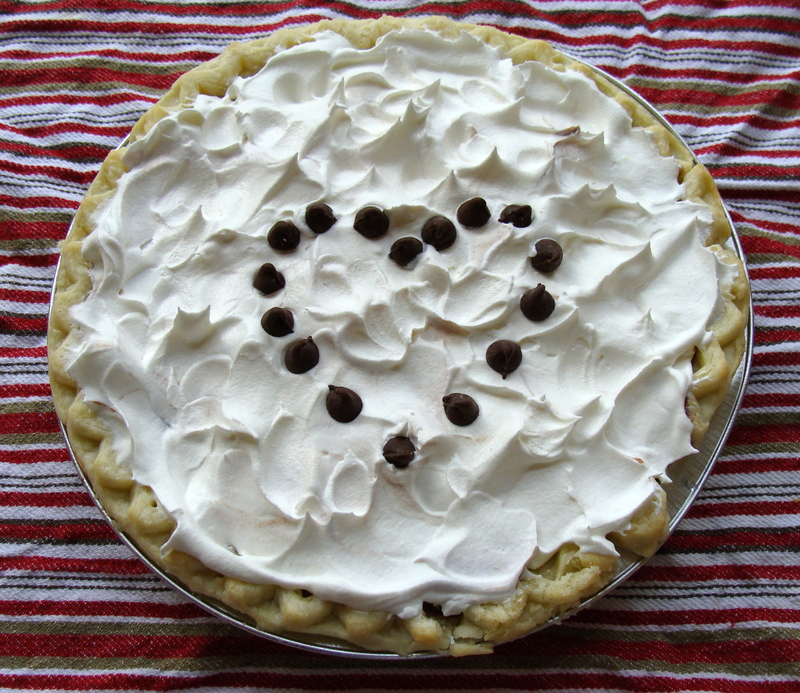 A deep dish pie crust and lite non-dairy whipped topping are all you need to delight your family. They will believe you spent hours in their service when you march this loveliness from the fridge. Accept your praise and never enlighten them that it took under forty-five minutes! 1 box Jello Cook and Serve Chocolate Pudding. Follow directions on box. Bake pie crust according to directions for a filled pie. Cook pudding according to pkg. instructions, then set pot in ice to cool down, stirring frequently. After crust is cooled, spoon pudding into crust and smoothe top. Refrigerate one hour before topping with Cool Whip. Sprinkle mini chocolate chips as an added touch. Sounds (reads?) like a good breakfast treat. Grated yolks. Not something I would have ever even considered. You truly do learn something new every day. Wow. You are certainly inspiring me to head to the grocery store!